The Everything Grows Interior Designer felt the Alocasia African Mask was the perfect compliment to this decor and made it a centerpiece in a modern chrome bowl. Even though its common name is African Mask, this Alocasia along with other Alocasia varieties is from Southeast Asia. Different varieties can grow quite large and be very dramatic. They require very good light, warmth, and humidity to thrive so they can be temperamental indoors. 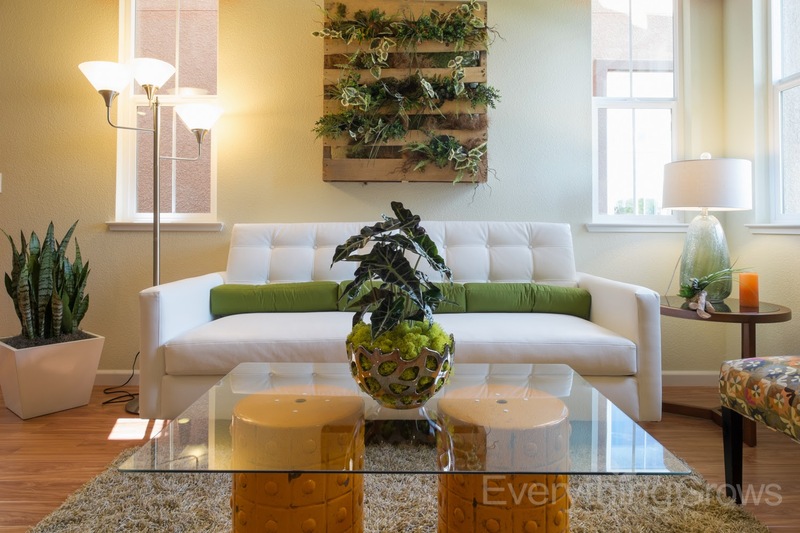 Note the plant to the left is the Sansevieria Zeylanica and the centerpiece above the couch is a plant wall in a shipping pallet. Are you ready to liven up your workspace with beautiful live plants? At Everything Grows selecting the right plants for your office environment is our specialty. Contact us today for a complimentary site visit and design consultation and let us come up with an interior landscape that will meet most every budget!